Today’s home standby generators are quieter and more reliable than ever before. They are also easier to maintain. Typically, Minnesota residential generators simply run off of existing natural gas lines. When that fuel source is unavailable, it is possible to use liquid propane or diesel fuel stored in a tank on the property. If the system detects a power outage, an automatic transfer switch keys the generator which begins to deliver power to your residence. Larger liquid-cooled units can power your home’s appliances, computers, and other essential electric-powered devices for lengthy periods of time. Small, air-cooled units are designed to deliver power to a few key electrical circuits at a time. General power requirements – Home appliances like stoves, refrigerators, humidifiers, etc. collectively require substantial amounts of power. Everyday conveniences are often taken for granted until they are absent. Water needs – Although some water can be stocked for drinking and cooking, the overall water needs of a home are significant. Those with their own wells often rely on electrical well pumps to keep the water flowing for showers, bathing and other personal hygiene requirements. Those with pets have additional water requirements. Electric water heaters must have power to deliver the hot water that you require for many daily needs. Heating and cooling – When the power goes out in hot or cold weather, it is often necessary for family members to leave the home, often within hours. It may even be necessary to stay at a hotel, possibly for days. Food preservation – Costs mount when food spoils in freezers and refrigerators. It takes time to determine what food it still good and what isn’t. It is a time-consuming and expensive task to suddenly have to restock your freezer and refrigerator from scratch. Households with additional standalone freezers or secondary refrigerators are at even greater risk. Medical devices – Family members may use certain devices that absolutely require electrical power, like respirators and CPAP machines. Rechargeable batteries power certain wheelchairs and other medical devices, and these batteries must be recharged periodically. Some individuals with respiratory conditions count on air conditioning units to supply cooled air during heat waves, and to filter pathogens from the home’s incoming air supply. Work at home responsibilities – Many workers that do not operate home businesses still work at home for hours every week. Cellular remote monitoring of a residential generator allows you to receive and share information anywhere your smart phone receives a signal. Confirm your generator’s current operational status, past maintenance history and upcoming maintenance recommendations. Enjoy the peace-of-mind that comes with automatic status change notification. Traditional ethernet or telephone-based computer connections require uninterrupted electrical power. Today’s cellular technology is low-cost, and it is available as you travel anywhere with cell phone service. It is possible to install the app in mere minutes. It is often possible to configure your system on your smart phone, thus eliminating traditional, time-consuming set-up requirements. The National Fire Protection Association (NFPA) regulates the distance between the generator and the home itself. In many installations, the base on which the generator rests is at least 18 inches from the exterior wall/foundation of the residence. Modern home standby generators often come with enclosures that withstand strong winds and severe weather. They’re often fabricated from corrosion-resistant aluminum alloy. These enclosures frequently include sound reduction technology for quieter operation. When a home standby generator is pressed into service, homeowners want to know that it will perform as designed. The engine is the most critical component, so it is not surprising that companies with a reputation for producing the best engines, like Kohler, often manufacture quality generators backed up by substantial warranties. Kohler, for example, offers a four-year standby, 2000-hour limited warranty. 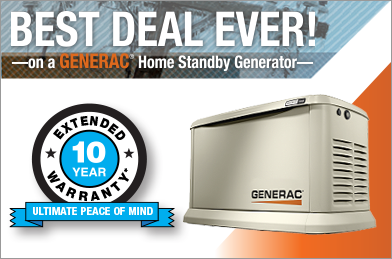 Midwest Electric & Generator is your one-stop source for generator sales, installation, service and maintenance. For prompt, friendly and professional service, please contact us.